On February 2, 2018, the Ukrainian army recaptured the village of Katerynivka in the Luhansk region of Eastern Ukraine. This maneuver is a reminder that there is still a large conflict taking place in the region between Ukrainian military troops and pro-Russian separatists aided by the Russian military. Both combatants continue to accuse one another of breaking the Minsk ceasefire agreement which was signed by several parties including the separatists currently holding the Ukrainian cities of Donetsk and Luhansk. The terms of agreement bar the use of weapons over 100mm in caliber in some areas established as secure zones. On January 19, 2018, Ukrainian parliament took up the task of officially defining precise areas of Eastern Ukraine that were seized and are currently held by pro-Russian separatists. Ukraine has defined these areas as occupied by Russia rather than describing the areas simply as occupied by pro-Russian separatists. This is because Ukraine sees this aggression as directly linked to Moscow and not simply a land-grab by partisan militia. Since the conflict began in 2014, battles between pro-Kyiv and pro-Russian forces transpired and, at times, escalated across Eastern Ukraine resulting in over 10,000 deaths many of which were civilians. During the process, two major cities, Luhansk and Donetsk were acquired by pro-Russian rebels. 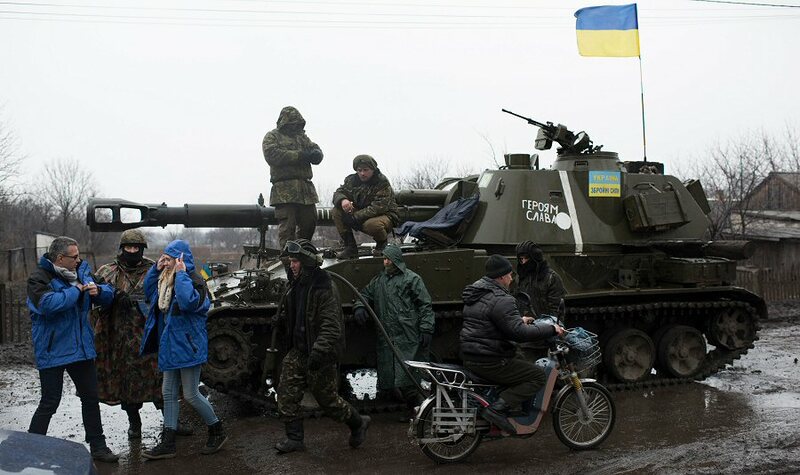 These lines of conflict appear now to be settling into definable areas notably in the surrounding villages of the unrecognized pro-Russian states, the Donetsk Peoples Republic (DPR) and the Luhansk Peoples Republic (LPR). It is common knowledge that pro-Russian rebels are given direct lethal aid in the form of troops and weapons by the Russian military. Journalist Simon Ostrovsky and others were able to prove that Russian military troops were operating in Ukraine. Ostrovsky investigated photos that troops posted on their personal profile on the Russian social media site VK. These photos depict Russian soldiers at notable Ukrainian sites while wearing full military attire. Russia has continued to deny this and insisted that those Russians involved in the conflict are only volunteers or “those carrying out certain tasks” as President Putin stated. It is unknown exactly to what extent the Russian military is involved in the conflict although many in Kyiv are convinced that if the situation does not begin to favor the separatists, Russia may result to using nuclear weapons. On February 16, the Secretary of the National Security and Defense Council (NSDC) of Ukraine, Oleksandr Turchynov stated that Russia could consider using nuclear weapons as Putin had once expressed in 2015 if anyone had interfered with his annexation of Crimea. He is convinced that if Putin had so casually threatened with nuclear weapons in 2015 there is nothing to stop him from doing so in the future. If there is a possibility that Russia would seek to use nuclear weapons against Ukraine and its allies, a large-scale war could ensue. However, it appears now that while tensions remain high the possibility of a larger conflict would be unlikely unless certain inflammatory events in the region transpired. As much mainstream media has, for the most part, meandered away from this topic. For those parties involved, the story of Eastern Ukraine is not finished yet.